I woke up on Tuesday morning in London on edge, thinking about Malaysia. A general election was due to be held the next day, Wednesday May 9, and I had not slept well. The campaigning had been outright dirty, even by Malaysia’s already chequered standards. We all knew this would be a crucial election – our country could not go on as it had. With Malaysia’s soul being fought for, it felt wrong to be so far away. The crazy idea entered my head that I ought to go back. I began searching the Internet for flights and tickets and found that if I took a flight on Tuesday evening, I would arrive in time for the election results. It would be a thirteen-hour flight on a trip I had not even planned, but so what? I had done mad things before. At the last general election five years prior, I had sat glued to screens in London, flipping between sites on the blogosphere. I was cautiously optimistic at the outset (see blog-post Malaysia’s Election Eve) and bitter by the end. I felt profound disappointment, not because what I had hoped for did not materialise, but because I believed that a small win had been stolen from the opposition. There were reports of a dodgy electoral roll, washable indelible ink, mysterious ballot boxes and non-Malaysian voters. As I sat and watched the numbers trickling in it was clear, even from London, that the results were being massaged. Incumbent wins were reported quickly while opposition wins were delayed. At some point I remember a convenient power breakdown at Radio Television Malaysia. Perhaps my memory is playing tricks, but that is what I recall. Would it be different this time? I did not know; I knew only what I felt – that I could not stay away. No matter what the outcome, I had to be there for these critical hours. I packed hurriedly. I was surprised by how full the flight was, crowded with returning Malaysians like me. We landed just after polls closed. Kuala Lumpur, though calm, had an element of tense excitement. It felt right to be back. Up in the air at thirty seven thousand feet, I finally understood how much Malaysia means to me. The bond I have with this land is unbreakeable. I carry Malaysia inside – it doesn’t matter that I’ve lived longer elsewhere. If I had stayed away at this seminal moment in Malaysia’s history, I would have regretted it for the rest of my life. The past forty eight hours have been exhilarating and sleepless, if a little worrying, but I would not have exchanged them for anything else. Yet, when I made the decision to come, we did not know how things would turn out. Some friends thought I was flying into trouble. We know now that the opposition coalition of hope, Pakatan Harapan, led by Malaysia’s former Prime Minister Tun Mahathir Mohamad, secured an unequivocal win . The transition to a new government is not over and there is plenty of speculation about attempted chicanery by members of the previous government. But they are now dust; I don’t want to talk about them. What I’d rather focus on is that even if you aren’t Malaysian and haven’t visited Malaysia, my country can still be a beacon for you. Because we Malaysians have achieved what once seemed utterly impossible. We have managed to vote out a government that was tyrannical, rotten and so corrupt by the end that I’m told its cronies were seen openly bribing voters on the streets. Despite this and despite using every trick in the book – the gerrymandering of boundaries, an Election Commission unfit for office, an electoral roll on which as many as 15% of voters did not have addresses – they lost. Malaysians voted them out. The odds were stacked against us, but we did it. We did this together, we Malaysians of all races and faiths. We came together as Malay, Chinese, Indian and everything in between; we came together as Muslim, Buddhist, Hindu, Christian, Sikh, atheist and whatever else; we came together for the common cause of saving our beloved country. We did this without bloodshed, riots or unrest. This is something we can truly be proud of. As I write this, the euphoria has not settled. We are still celebrating. The road forward will be hard – we know that. But it does not detract from what a great thing we Malaysians have done. And if we can do it, others can too. God bless Malaysia. Below is a photo of a dedicated food court in Ipoh, my hometown. By ‘dedicated’ I mean that it’s not attached to a shopping mall – the GP Food Court is a destination in itself. The building sports ultra-high ceilings that permit an extra floor above. This space houses a gym, though I can’t imagine how anyone would exercise in the midst of such tempting smells. Which may explain why I’ve yet to see the machines upstairs being used. You can smell the food court before you actually enter, thanks to massive doorways in every direction. As if the aroma of so much food cooking wasn’t bound to waft upwards and outwards anyway, at the GP Food Court there are giant fans to aid this drift. The fans here really are enormous. You can glimpse an example above, on the top edge of the photograph. They swing at speed, too, though you can’t see this: you’ll have to take my word for it! Food courts everywhere excel in choice, but there’s choice and then there’s choice. Take a peek at the photograph below. This is the selection at just one stall. 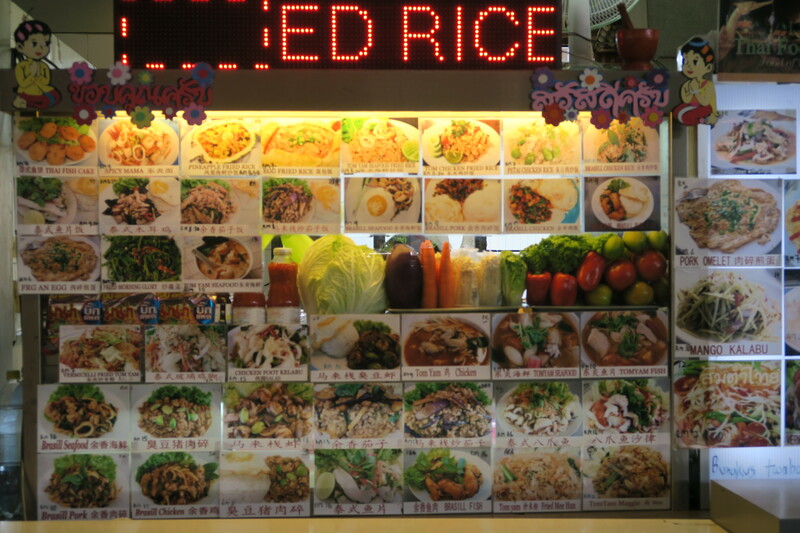 Notwithstanding the neon sign advertising ‘Rice’, this stall also serves noodles, in case you don’t fancy rice. It’s a well-known fact that you can’t serve rice and noodles on their own – you need things to eat them with – and this stallholder is thoughtfully offering a panoply of dishes: braised, fried, boiled, double-boiled (all right, I made that up, though I imagine that they would if they could). There are raw dishes too, in the form of salads. The sheer amount of choice can induce a headache. This is what happens to my partner; on each and every trip to Malaysia there’s always a first time in a food court and it’s as if she has never seen anything like it before. She’s overwhelmed, her eyes don’t know where to focus and her brain stops making decisions. She opts instead for the one or two dishes she knows – and never tries anything else. Chicken Chop Rice with Guinness Sauce, Anyone? Malaysians, on the other hand, are so blasé about food choice that stallholders have to be inventive. Ever tried Chicken Chop Rice with Guinness Sauce? Me neither. There’s also Portuguese Style Chicken Chop Rice on the top left hand side – a nod to our colonial history. Most people know Malaysia as a British colony, but the Portuguese were actually here before them, followed by the Dutch. The latter two powers only conquered Malacca, a beautiful and very historical port town south of Kuala Lumpur. Our colonial past would explain why Cheese Baked Chicken Chop Rice is on this menu – cheese is definitely not Malaysian. You may also notice that the signboards have Chinese ideograms and English words. This is because the GP Food Court is not halal, you see, which means that its patrons are largely Chinese and Indian. 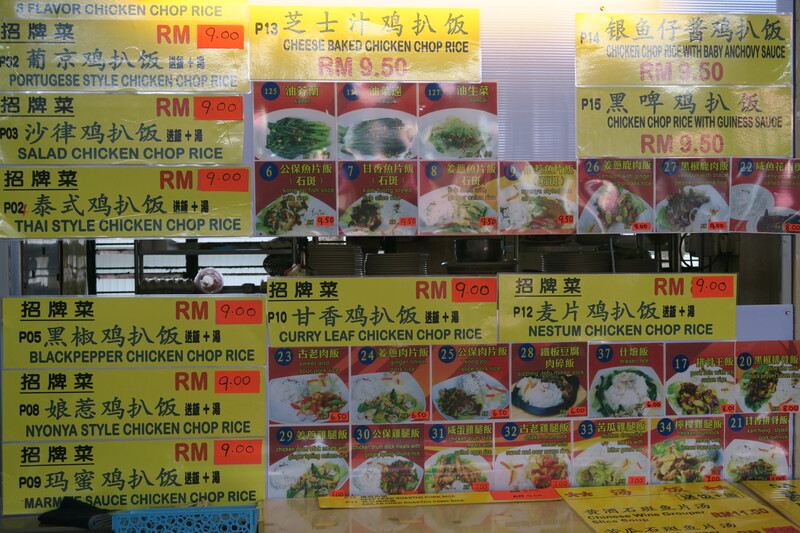 The Malay populace – who by law have to be Muslim in Malaysia – would be frowned on if they entered a non-halal food court – not frowned on by us, but by Malaysia’s religious officials and the religious police among its citizenry. Who said food couldn’t be a political tool? Nonetheless, there are (for the moment) still Malay vendors selling food inside Malaysia’s non-halal eating places, including at the GP Food Court. They usually specialise in satay – a traditional Malay dish of meat that’s diced and marinated, set on skewers and then grilled over a charcoal flame fanned by palm leaves. Satay is eaten with a rich and deliciously spicy peanut sauce. The woman satay seller in the GP Food Court owns satay stalls in two other food courts – and we eat at all three (I love her satay). To cleanse the palate, there’s also fruit at the GP Food Court. Not just any fruit, but imported fruit. In England or France, a trader would proudly proclaim his fruit as being British or French, but we in Malaysia still have the whiff of a complex. 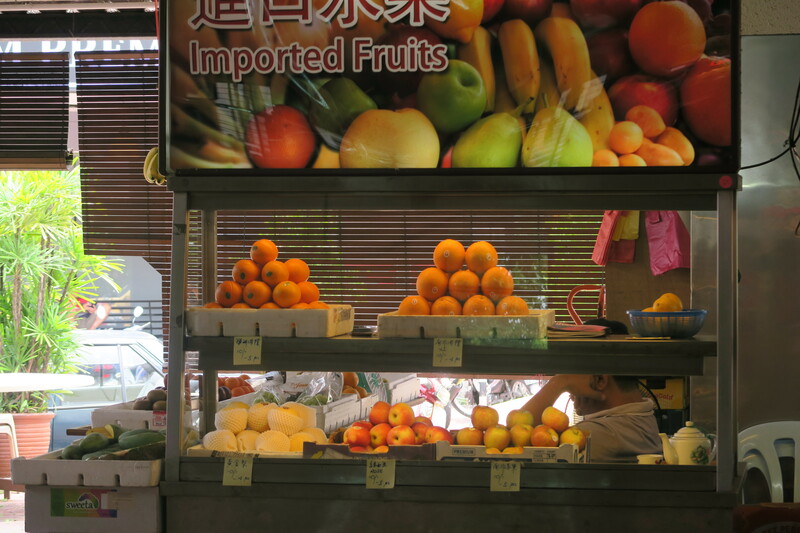 The subtext from this stallholder’s sign is that the fruit must be good, since it’s imported. 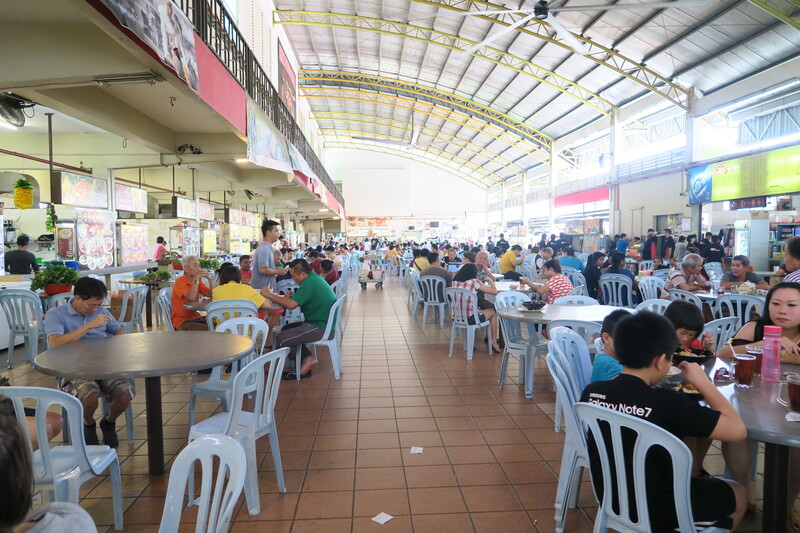 There are thousands of food courts like this all over Malaysia. There are also halal food courts, of course. For instance, the food courts inside Malaysia’s shopping malls are all halal – because only hawkers offering halal food can gain operating licences there. Whether halal or non-halal, whether located in Ipoh, Kuala Lumpur, Penang or Malacca, on each of my visits in the previous ten years, every food court I went to was packed. But what people eat and how much they eat has changed – because times are now tough in Malaysia. So tough, in fact, that even leading entertainers are speaking up. This is unprecedented. Only last week jazz singer, Sheila Majid, tweeted about Malaysia’s cost of living while a popular actress, Nur Fathia Latiff, criticised the government. Not surprisingly, both have been told to shut up. None of this should affect visitors, however: the country remains stunning, the people welcoming, the food fabulous. Even on my most recent trip the meals I had ranged from good to superb: it’s hard to have a terrible meal in Malaysia. If you ever make it there, I would definitely recommend a visit to a dedicated food court. Be dazzled; be spoilt for choice. Do what Malaysians do: let your nose and eyes guide you. If the food smells good and there’s a queue, chances are, you won’t regret it. 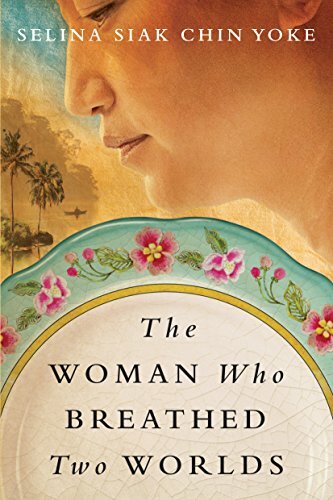 I’m thrilled to tell you that my novel – The Woman who Breathed Two Worlds – will be launched on November 1, 2016 in three formats: in print, as a Kindle e-book and also as an audio book. Below is what the cover will look like. I love the artwork, I think it’s amazing – and I’m not just saying this because it happens to be my book. If you’ve been waiting for my novel, the good news is that it’s now available to pre-order! Here are some of the stores which will stock it: Kinokuniya in Malaysia ; Kinokuniya in Singapore; Waterstones in the UK; Barnes & Noble in the USA and of course Amazon. I mentioned before that I was stunned by how much work goes into a published book. I had expected the text to be scrutinised; this, after all, is the heart of a book, but I never imagined I would be taught the fine points of English grammar in the process! For instance, I was told that I used the “subjunctive were” a lot (one of the copy editor’s comments). Funnily enough, I did not know what a “subjunctive were” was: I had to look it up on Google. It’s a relief to know that there are still people on this planet who understand the rules of English grammar. When I see the types of grammatical mistakes being made nowadays, I have to conclude that such people are a dying breed. So I’m really glad to find them in publishing! At the outset, I was asked whether I wanted to be consulted about my book cover. Of course I said yes, and I’m glad I did – because it has allowed me to appreciate the amount of thought which designers put into book covers. Everyone sort of knows that book covers are important, but how much attention do you really give them beyond whether they are “nice” or not? I don’t suppose that many authors have much involvement with the creation of their audio books. Because of the peppering of Malay and Chinese dialect words in my novel, I had offered pronunciation assistance to the narrator, a British actress by the name of Christine Rendel. I did not know whether Christine would take my offer up, and was impressed when she not only did but came prepared with an array of of questions. I had to explain how to say “ai-yahh” and “lah” and “ngi cho ma kai-ah”, among other things. And now I can’t wait to hear what she has done with these expressions! Finally, a word about my publisher Amazon Crossing – Amazon Publishing’s translated works imprint. In line with its remit Amazon Crossing has to date mainly published works written in other languages and translated into English. I’m pleased to be among the handful of authors writing in English whom they have chosen to publish, and especially honoured that they selected my debut novel. I must thank the whole team in Seattle, most of whom I have not met, many whose names I don’t even know, for being so pro-active and re-active and patient with the questions I’ve asked. My editor, Elizabeth DeNoma, has been exemplary. Her job, apart from managing various strands of the book production process, has included holding my hand, especially as publication day creeps ever closer. Because, with less than two months to go, my emotions are starting to cause havoc. This may sound counter-intuitive but I’ve become increasingly nervous; what if people hate my book? To be honest, I’m having trouble sleeping properly. I fear I may be a wreck by November. Thank goodness I’ll be visiting Malaysia before then – I’ll certainly need doses of petai and Nyonya kueh to calm those nerves! If any of you are in Malaysia in October, please come and hear me read an excerpt from The Woman who Breathed Two Worlds. I will be at The Sharpened Word in Ipoh, my hometown, on Saturday, October 15, 2016 and then at Seksan, Bangsar Village in Kuala Lumpur a fortnight later on Saturday, October 29, 2016. Details will be posted here in due course. Meanwhile I’ve been asked for an interview. Part of me cannot believe this is actually happening… For so long I dreamt about having a novel published. But I had other interests too and I pursued these first. If I had not had cancer when I did, I would probably only have started writing seriously much later. Which goes to show that positive things can rise out of the ashes of personal difficulty. Taking this novel from concept to publication has taken longer than I ever imagined it would. Nearly six years, to be precise : two months of research, two years of writing, another year to secure an agent, nearly two years for him to find a publisher and then the months Amazon Crossing has spent turning my raw manuscript into a printed book. Now it feels as if I’m standing on the threshold of something new, a different stage in my writing journey, when I can look back on the hard slog and think that, no matter what happens next, it has all been worth it. Sometimes, dreams do come true. Tomorrow, August 31, is Malaysia’s Independence (Merdeka) Day. Shortly after Merdeka Day thirty six years ago, I left Malaysia. I’ve lived away for so long now that I have spent more time in England than in my country of origin. Yet, nothing grips me as much as major pieces of Malaysian news. Last July for example, when MH-17 was shot down over Ukraine, I was riveted: engaged in both heart and mind, emotions veering between horror and utter disbelief, and finally anger. Hours later, when it was already clear that the plane had not crashed accidentally but had been shot down by a missile, major media networks (in three languages) changed their headlines to reflect this appalling new element. All except for the BBC, which retained its misleading “Malaysian Plane Crashes in Ukraine” as if it had been Malaysian Airlines’ fault, as if the plane’s flight path had not been pre-cleared. I was so incensed that I wiped the BBC app off my iPhone. This weekend, I have once again been glued to Malaysian news. A 34-hour protest has been taking place in Kuala Lumpur, Malaysia’s capital. People were out in force – two hundred thousand according to the organisers, a mere twenty thousand by the government’s count. Most of the protesters wore yellow T shirts (hastily banned beforehand by authorities), blew into their vuvuzelas and air-horns, prayed when it was time to pray, listened to speeches and made music – all quite peacefully. Many even stayed overnight as had been planned, literally sleeping on the streets and squares of the capital. To see what it was like during the final hour of this marathon rally, see the attached link. The protest was organised by Bersih (Clean), an organisation which is campaigning for clean, fair elections in Malaysia. This was the fourth rally organised by Bersih. At the previous demonstration before this one, an estimated quarter of a million turned up and police used teargas on the crowds. Not surprisingly, the Malaysian government – which has a rather low tolerance of dissent – was up to its usual tricks last week. They first declared the rally to be “illegal”. When that didn’t work, the Home Minister banned yellow clothing and T shirts with the words “Bersih 4”. The authorities, knowing that a sleep-in was planned, promptly prohibited the erection of tents. Despite these absurd obstacles, yellow T shirts abounded on KL’s streets. Demonstrators proceeded with their “sleep-over” – truly a sight to behold. Of course there have been plenty of naysayers, as there always are. People who belittle Bersih for “not going far enough”, and the protest as little more than the huff of a few well-heeled urbanites. As the former chairperson of Bersih – the redoubtable Ambiga Sreenevasan – has pointed out, Bersih’s rallies take place despite the organisation having little money and no power and in spite of the entire machinery of government being arrayed against them. These rallies rely entirely on “the goodwill of the people”. Which is why they are remarkable: Bersih‘s rallies are tangible signs of a nascent civil society. Street protest flies in the face of Malaysian tradition. As a nation, we prefer to avoid even the smell of conflict. We stick to safe topics, such as shopping, and of course, food! We can say a lot about food without touching on anything remotely controversial, anything that (we fear) may offend someone. If you spend your life in this “head-down, risk-free” zone, the thought of going on a march where you may be asked to hold a banner or shout and generally take a stand, is rather alien. Mahathir Mohamed, the former Prime Minister who turned up at the rally on both days, gave an interview in which he admitted that it was the first time he had joined a street protest – and he is ninety. I only learnt about protest as a student at Southampton University in Britain. The experience was incredibly liberating. I discovered what democracy should actually be about. I found that in a truly democratic country, people were free to express legitimate political views, so long as they did not advocate violence on anyone else or infringe on the rights of others. In contrast to Malaysia, I could say what I felt without being shut down, called names or told to leave the country. I went on marches, I held placards, I became an activist. I disagreed vehemently with some people, and still managed to remain friends with them. The whole process was thoroughly validating. Among my causes: gay rights. There were absolutely no positive gay role models then, and your boss could have fired you if s/he discovered your sexual orientation, no matter how well you did your job. It was such a far cry from today that it is hard to even remember what Britain was like in the mid-eighties. If anyone had told me then that in less than thirty we would be able to marry one another, I would have laughed out loud. This example goes to show that protest can bring about change. You only have to think of the suffragettes to be reminded that without them, women would never have obtained the vote. Without protest, we would also not be attending universities today. Could the same natural evolution happen in Malaysia? On this, the signs are not good. The Malaysian government is one which loves the legitimacy that its veneer of democracy confers, at the same time as it hates the reality. Citizens wanting to hold Ministers accountable: what a nuisance. As for the possibility that the government might actually be voted out of office, perish the thought! After fifty eight years in power, any government would be tired; this one is especially tired – of criticism from those pesky citizens. In recent days and weeks, Malaysian Ministers have acted with their usual brilliance. In late July, a leading business publication exposed the fact that US$700 million had entered the Prime Minister’s personal bank account. The official response? Suspend said publication for three months. How dare journalists do their jobs! This week, when it became clear that threats and intimidation were not going to prevent the weekend’s rally, the government blocked access to Bersih’s website (within Malaysia). No wonder America’s former ambassador to Malaysia has voiced his worries. In a recent opinion piece, Mr. John Malott described how there are two faces to Malaysia’s current Prime Minister Najib Razak: the international man who knows what Westerners want to hear, and the domestic man who happily lines his and his wife’s pockets while curbing individual liberties and meddling with institutions. As if to confirm his increasingly authoritarian streak, the Prime Minister told the nation yesterday: “All forms of street demonstration have to be rejected as they adversely affect peace and order and cause problems to the public.” Apparently, only “immature” people express their views by protesting on the streets. Such words (and his actions) do not bode well. Where will Malaysia go from here? Will the Prime Minister step down tomorrow? Unfortunately, this is unlikely. Will we see greater restrictions on freedom in Malaysia? Possibly. Could the country veer towards dictatorship? As an optimist, I believe that positive change will come, but this will take longer than we either think or would like. What is important is for concerned Malaysians not to give up. We need to remain engaged, to stay strong and show that we will demand good governance, no matter how much our own government threatens us. For the sake of Malaysia’s future, we will not go away. Not until we have clean, fair elections and an end to rampant corruption and cronyism. I remember the first time I heard the word. It was more a cry really, a shout which came back in a dream, stirring the depths of my memory. I wonder what the word conjures up for you. Does it evoke an image? I would love to know. Please click below to answer a simple question. It was the tone in which ‘Chinaman’ was said which must have caught my attention, because I began to ask questions. The adults around me squirmed, and then became evasive as they pretended that ‘Chinaman’ was an innocuous word. They told me it referred to a man from China, in the same way that ‘Englishman’ referred to a man from England. ‘Chinaman’ had a ring to it; the word shook the dust, as if phlegm were being expelled. No one said ‘Englishman’ in the same way, or ‘Frenchman’, or any other word which contained the name of a country. As I grew up, I learnt its many connotations. No wonder the adults had been ambiguous. There is nothing attractive in the descriptions above, and they must have been embarrassed at having to explain themselves. Every one of them was of Chinese ethnicity, and I wonder what they could have been thinking. If you were Chinese – a Chinaman or a Chinawoman – what did you have to tell yourself in order to be able to spit out ‘Chinaman’, a word loaded with implications, so easily? How did you deal with the confusion which must have lurked somewhere inside your head and your heart? As I held the contradictions inside, I veered between shame and outsized pride. There were moments when I shuddered, disgusted at my association with a race of coarse, yellow-skinned peasants who spat on the street and spiced each meal with slurping and burping. How could I have come from the same stock? There was no escaping genetics, but I sometimes pretended I could. I had to make these ‘Chinamen’ separate from me. Before I came into the world, my grandfather and granduncles did the same. They were born in Malaya in the early 1900s, a time when China was fast declining while Britain’s star remained in the ascent. 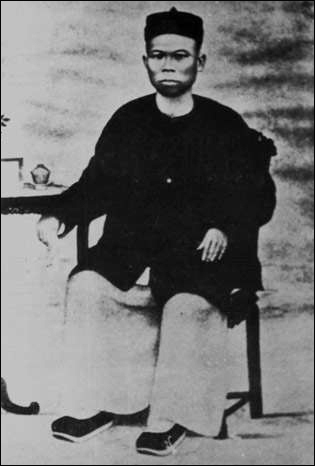 My great-grandfather Chin Choon Sam was a first-generation Chinese immigrant who married a Nyonya woman, my legendarily fierce great-grandmother. 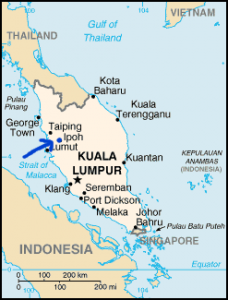 When my great-grandfather settled in Ipoh (see map and blog-post My Ipoh), he raised a second family, as was common with Chinese immigrants of the time who had left families behind in China. We know little about his first family other than that he had a China-born son, who often visited his half-siblings in Malaya. His two families were raised very differently, however. With the onslaught of British colonisation, his Malayan sons were educated in English – at the Anglo-Chinese School in Ipoh. This is one of Malaysia’s most famous schools and among the first to be founded by missionaries (as detailed in my blog-post Smart Girls don’t find Husbands?!). My grandfather and granduncles learnt to speak and write fluently in English; they wore Western clothes, adopted healthy doses of British manners, and converted to Christianity. In contrast, their China-born half-brother, having been schooled in China, spoke only Chinese and was more comfortable with traditional Chinese customs. It was perhaps inevitable that my grandfather and granduncles thought themselves superior to this ‘Chinaman’ among them. We have no photographs of my China-born granduncle; whenever I try to imagine what he looked like, all I can see is a man with a brown face, clad in a Mandarin suit, his hair covered by a cloth cap or a hard conical hat. This, I realise, is simply an image of a Chinaman I have picked up somewhere along the way, a picture not unlike that well-known photograph of Yap Ah Loy, the founder of Kuala Lumpur (see map), Malaysia’s capital city. I wonder what my Westernised grandfather and granduncles must have thought as they sat with the supposedly flesh-and-blood intruder inside their home. Perhaps choice words came into their minds? The poor man eventually decided his prospects would be better in his native country and returned there for good. I only hope life wasn’t too harsh for him after the Communists came to power. For a long time, we English-speaking Malaysian-Chinese walked with a swagger. Our compatriots felt our condescension, as I was reminded by a Malaysian-Chinese friend from a Chinese-speaking background. She herself attended a Chinese language primary school before continuing to one of the former mission schools for her secondary education. There, she met Malaysian-Chinese students from English-speaking homes. It was then that she felt the subtle divide which separated her from her English-speaking peers. Nothing was ever said and no one was openly rude, but she knew she was perceived as a lesser person: less wealthy, more ulu (market Malay for backward), not as well-dressed. In the canteen, social segregation took place; English and Chinese speakers usually sat in separate groups. Segregation continued inside the classroom, because in Malaysia, students are streamed according to ability and in general, English-speaking students achieved better examination results. For my friend, what she felt palpably from one day to another drove her. She wanted to prove to her English-speaking classmates that she was their equal. She has succeeded admirably in this goal; after university in Australia, she worked for a multinational company and now lives a global lifestyle. Years later when she recounted her story, I could still hear the anguish in her voice. My friend’s success has come at a price though: she has now forgotten her Mandarin. This is largely in the past. With the rise of China, social perceptions have changed. Malaysians no longer look to the West in the same way, and Malaysian-Chinese now prefer their children to be educated in Chinese (for political reasons which I will not discuss here). In this brave new world, even the word ‘Chinaman’ has lost some of its sting. But a shifting state of affairs always brings its own challenges. A recent review in the UK’s Guardian paper brought home to me what some of these may be. The reviews was of the much-acclaimed novel Chinaman which is about, of all things, cricket. Guile and gullibility, juxtaposed effortlessly over one another. This tells me that there are people – perhaps many – who fear and loathe the Chinese (us Chinese?) at the same time. (I rewrote that last sentence repeatedly and still couldn’t decide which phrase to use. Who do I stand with here? Do people regard me in the same way as they do the mainland Chinese? Do they fear us too but would never say so openly?) Their fear and loathing may well increase as China continues to ascend, as it surely will. And while this happens, we overseas Chinese will have to continually reassess our relationship with the land our ancestors once graced, as well as with each other, whether or not we wish to. The taxi had just dropped a passenger off at my hotel in Kuala Lumpur when I jumped into it. It was an old car, not one of the swankier blue ‘executive’ taxis I had seen. The driver, a Chinese man, asked in English: “Where you want to go?” Without thinking, I replied in English – a mistake, because my accent was a dead give-away. The guy probably thought I would be easy prey. After I explained where I wanted to go, I noticed the meter at the front whirring rather rapidly. It was then that I decided to switch into Cantonese. The following conversation ensued. I did. He stopped the car and I walked back to the hotel. Fortunately, we hadn’t travelled far. Unfortunately I was staying at the Mandarin Oriental, a wonderfully plush place but where no taxi comes cheap. The next car I hopped into was somewhat better, but the driver couldn’t find my destination. For what I ended up paying, I could have taken a return journey from Kuala Lumpur to Ipoh on the electric train (205 km) with change to spare. I looked at the man in astonishment. Neither my partner nor I had said anything to warrant such an outburst; in fact, complaints were the last thing on our minds. When we climbed out of the car to wait, our conversation took an even more bizarre turn. Something in my voice must have shaken the man, because he finally lifted our suitcases out. We were so relieved to be rid of the guy that we paid the fare and gave him a healthy tip. These incidents blighted my experience of Malaysia. I dreaded getting into a taxi, knowing we would have an argument either at the beginning (if, despite the meter, you agreed the fare upfront) or at the end (if you hadn’t agreed a fare and weren’t going to pay what the meter purported to show). If I could be treated so abominably, what hope would there be for visitors who don’t speak our local languages? Just as I was ready to give up hope of ever finding a decent taxi in Malaysia, we discovered a ‘local’ taxi company. ‘Local’ just means they’re not the blue ‘executive’ taxis favoured by tourists. Local taxis may not look as nice, but they are clean and air-conditioned. The drivers are polite, they come on time, they know their roads and most importantly, their meters appear to work as they should. I was the customer, yet I was expected to call them back. Obviously a case of too much demand, not enough supply. I resorted to calling my hotel and asking for an executive taxi. It cost twice as much as Super Cab would have, with no discernible difference in quality, but it saved me much aggravation. Sadly, it seems this drama entitled The Taxi Drivers and I, is set to continue running. This week, I’ve decided to become a part-time tourist. I’m in Kuala Lumpur , capital of Malaysia, bustling metropolis, city of gleaming skyscrapers. At least, that’s the image Tourism Malaysia likes to project. But this image, like many others, is part of a more complex reality. So what’s Malaysia really like? In a series of short blog-posts, snapshots really, I’d like to share my personal impressions as a returning visitor. Most of these snapshots won’t relate directly to my novel, some will, but I hope all will help provide a better picture of what Malaysia has become today. Although I know I’m not the average tourist, most people seem to assume I’m a foreigner. It must be the way I stride around. They’re usually shocked when I start speaking in Malay or Cantonese. Up till that moment, I’m sure my experience is as good as any tourist’s. So it only seems appropriate for my first snapshot to be about Malaysian hospitality. Forgive me for beginning with a cliché: Malaysian hospitality really is as warm as that projected in advertisements. Thank goodness for that, because things often don’t work the way they’re supposed to in this country. Take the online check-in process with Malaysian Airlines. I couldn’t for the life of me work out how to check my partner and me in online (it turned out I wasn’t given an obscure piece of information which the website requires). So I called the helpline number on the website, and bingo! Problems resolved, with true Malaysian service in the process. The man who answered the call stayed with me throughout, listening to what I was doing, repeating numbers and letters, until I had checked us both in. Even though I was still in London at the time, the service struck me as different: there was warmth, a friendliness which I thought distinctly Malaysian. (Tip: if you ever need help on anything Malaysian, find a real person to speak to). The same thing happened with my pre-paid SIM card. I had difficulty topping it up online. After fiddling for several hours, I gave up. I took it back to the shop, where the man remembered me from when I had bought the card. With a smile, he asked after my partner and topped up the SIM card in 3 seconds flat. Examples like these happen all the time. I personally think that what we know today as Malaysian service comes from traditional Malay hospitality, which is gracious, gentle and full of warmth. I love it; it evokes a feeling which is distinctly Malaysian. For this, we have to thank our Malay fellow-citizens, whose language encapsulates the essence of this hospitality. ‘Thank You’ in Malay is ‘Terima Kasih.’ Literally translated, the words mean ‘Receive Love’. Long may Malaysian service continue being what it is.